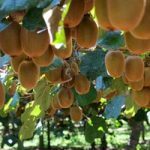 We also supply species and varieties of hardy kiwi fruits, which are smaller but nicer than the hairy kiwi fruits found in shops. Male and female plants are required for fruiting. Plants are pot grown. ‘Jenny’ bears the familiar fuzzy fruits that you can buy in the shops. Creates vigorous vines which need a wall or fence to climb on – or you can climb them up trees but stop their growth before they get too high or you’ll need a helicopter to harvest. Hardy to about -15°C, they may need protection against late spring frosts in cooler areas. Plant male and female vines, or one of the self-fertile varieties (though these fruit better with a male around too). Grown in 2-3L pots.